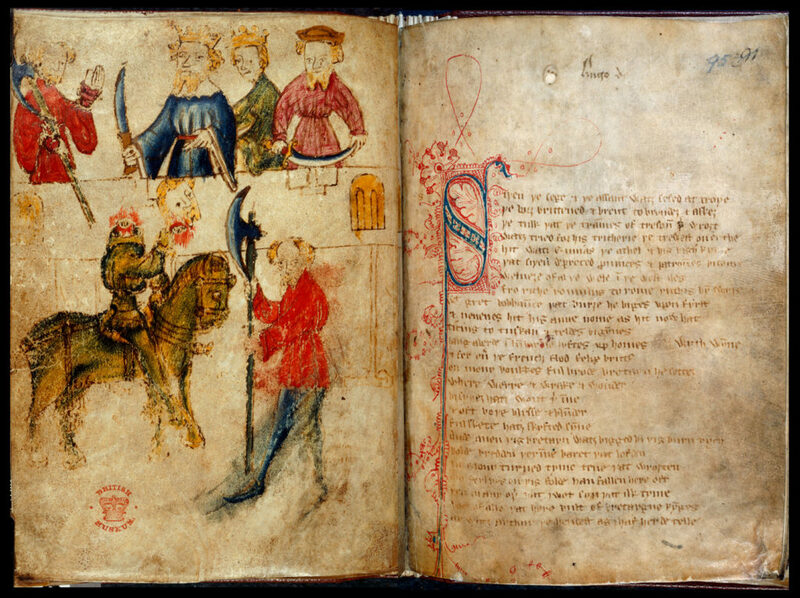 For many students, Sir Gawain and the Green Knight will likely be the first medieval text they are assigned to read. Frequently included in popular anthologies such as the Norton, Sir Gawain is a story that even non-medievalists such as myself are likely to have some degree of familiarity with. However, despite the poem’s familiarity Sir Gawain still holds a number of surprises in store for scholars and readers. In particular, I wish to discuss here what have come to be known as the four “fitts” the poem is commonly divided into. In the introduction to their 1925 scholarly edition of the poem J.R.R. Tolkien and E. V. Gordon note that “The four main divisions of the poem are indicated by large ornamental coloured capitals. Smaller coloured capitals without ornament occur at the beginning of lines 619, 1421, 1893, 2259.” In her scholarship Hill dug deeper into these paleogeographic descriptions, casting doubt on whether Tolkien and Gordon’s descriptions of the capitals as “large” or “small” were entirely accurate, and on whether the degrees of the capitals’ ornamentation stands up to scrutiny as a justification for the divisions. Ultimately, Hill advocated for a nine-part division recognizing all of the manuscript’s capitals as places of division. Hill ended her argument with the emphatic claim, “It has become evident, however, that there is no absolute four-fold division of Gawain. Such a division exists only in printed tradition and cannot be supported by any attentive examination of Cotton Nero A.x. or of the poem itself.” I have included at the end of this post Hill’s diagram showing at what points in the narrative the capitals recognized in her nine-fold division occur in contrast to Madden’s. Kathryn Kerby-Fulton notes of the nine potential divisions, “One could make several observations: first, the divisions closely parallel the spirit of the medieval narrative summaries marking progress through romances—these tend to mark knightly clashes, deaths, and miraculous events. Second, perhaps more profoundly, the medieval divisions mark moments of soul searching.” Although the four-fitt division creates a recognizable narrative structure for modern readers, it perhaps does so at the expense of the potentially richer alternative of attempting to recover these earlier conceptions of narrative progression. Most subsequent editions since Hill’s article up to the present day have maintained Madden’s four-part division; however, an enriching scholarly conversation has taken up the debate surrounding the question of the four-fitt division’s paleographic merits. Unfortunately, this debate has been largely absent from the paratextual materials of many modern editions, such as Simon Armitage’s popular translation (which has since been taken up and used by the Norton). Many of these editions do not attempt to justify or explain their decision to retain Madden’s four-part division; due to the significant nature of Madden’s intervention it seems like an error to avoid addressing this decision, as many of the poem’s readers will, as a result, remain unaware about the poem’s structural uncertainty. I hope that recent scholarly endeavors such as the Cotton Nero A.x. Project, which seeks to increase access to the manuscript by digitizing it, will help to resuscitate this scholarly debate and perhaps even inspire new editions of Sir Gawainthat adhere more closely to the manuscript’s structure. I S Part I The beheading test, part 1; the new year, the blow received, lines 1-490. II T Part II The year passes before the annual combat; the knight is armed: lines 491-618. III T N/A The pentangle, the character of Gawain; the journey; Christmas Eve Gawain’s prayer for guidance; Lines 619-762. IV N N/A The sudden appearance of the perilous castle; Gawain’s reception; Christmas festivities; the exchange winnings proposed and accepted; Lines 763-1125. 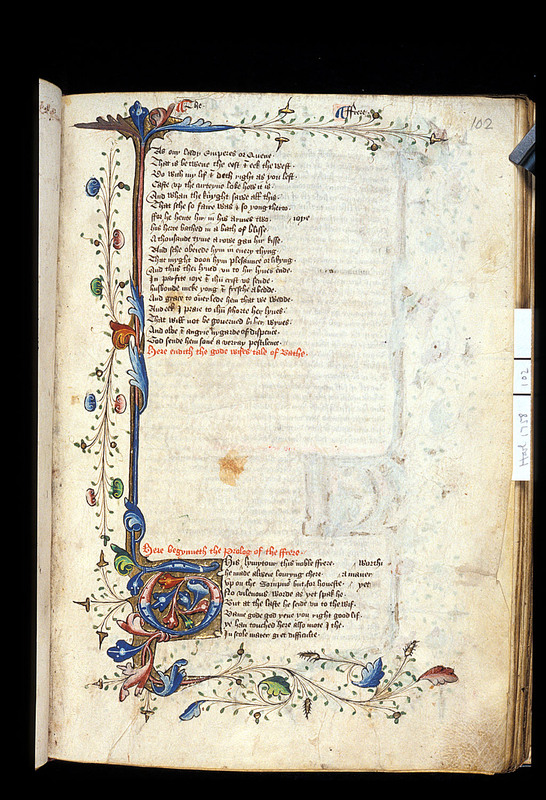 V F Part III The huntsman host; the deer hunt; temptation 1; lines 1126-1420. VI S N/A The huntsman host; the boar hunt; temptation 2; the fox hunt; temptation 3; the magic girdle; Lines 1421-1892. VII N N/A The fox hunt concluded; Gawain asks for a guide; he bids goodbye to those in the castle: lines 1893-1997. VIII N Part IV New Year; the journey resumed; the ford perilous; the Green Knight appears: lines 1998-2258. IX T N/A The beheading test part 2; the blow returned; the connection of Morgan la Faye with the plot; Gawain returns to Arthur’s court: lines 2259-2530. Source: Hill, Laurita Lyttleton. “Madden's Divisions of Sir Gawain and the `Large Initial Capitals' of Cotton Nero A.X..” Speculum, 21, 1, 1946, pp 70-71. Laurita Lyttleton Hill, “Madden’s Divisions of Sir Gawain and the `Large Initial Capitals’ of Cotton Nero A.X..” (21:1), 67. V. Gordon and J.R.R. Tolkien, editors, Sir Gawain and the Green Knight. VIII. Kathryn Kerby-Fulton, Madie Hilmo, and Linda Olson, Opening Up Middle English Manuscripts. 59. The advent of e-books has prompted discussion about the experience of reading and its relationship to a material text. Opponents of digital books speak fondly of holding a book in hand, the ability to feel the weight of the object and physically see yourself progress through the text. There is a sense of something lost when this object changes form, when paper becomes plastic, when clicking replaces page-turning, when your sense of place in the text is measured by percentage rather than pages. Of course, changes in the way in which we materially experience reading have been going on far longer than the recent shift to digital media. The book versions of older texts are in many ways even more distant from their original form than digital books are to their print ancestors. The placement of the bob obviously has some impact upon our understanding of the poem. But what about that illusive “reading experience”? The modern editions fundamentally change this as well. Imagine, for a minute, that you are a medieval reader. When you read the bob, do you hear it exactly where it is placed? Do you hear it where the modern editor would move it to? Or do you hear it after multiple lines? Perhaps your eye floats out to it on several occasions, placing it in multiple positions and playing with its flexible meanings. 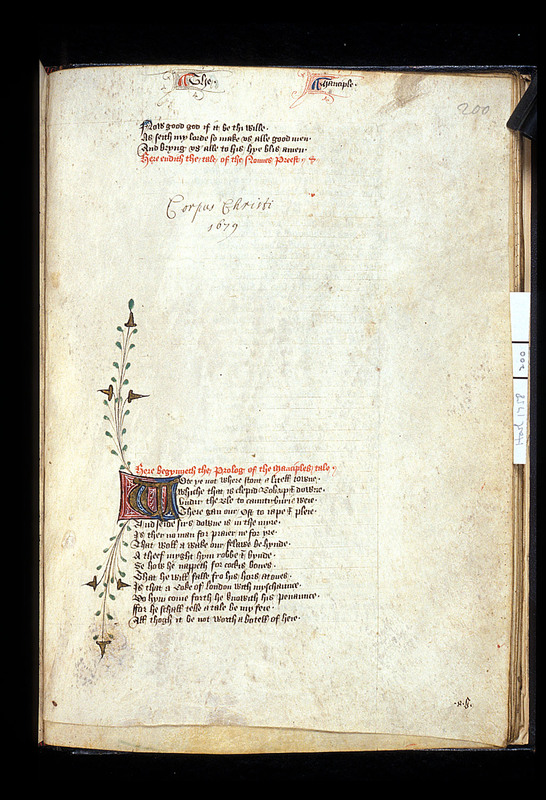 Gawain, after all, is a poem of playful language and deceit, and the poet is noted for his use of puns in Pearl. No modern edition has been printed that maintains the manuscript’s irregular placement of the bob. The solution, then, is to turn back to the manuscript: to printed facsimiles, but also, perhaps counterintuitively, to digital scans of the original pages. Andrew, Malcolm, and Ronald Waldron. 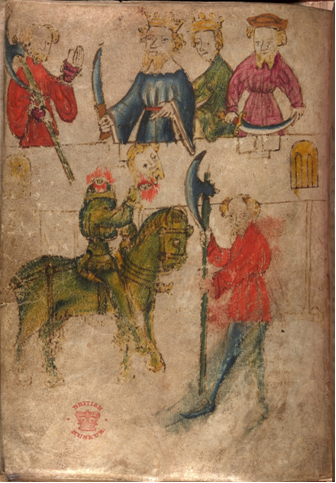 The Poems of the Pearl Manuscript: Pearl, Cleanness, Patience, Sir Gawain and the Green Knight. University of California Press, 1982. Kerby-Fulton, Kathryn, Maidie Hilmo, and Linda Olson. 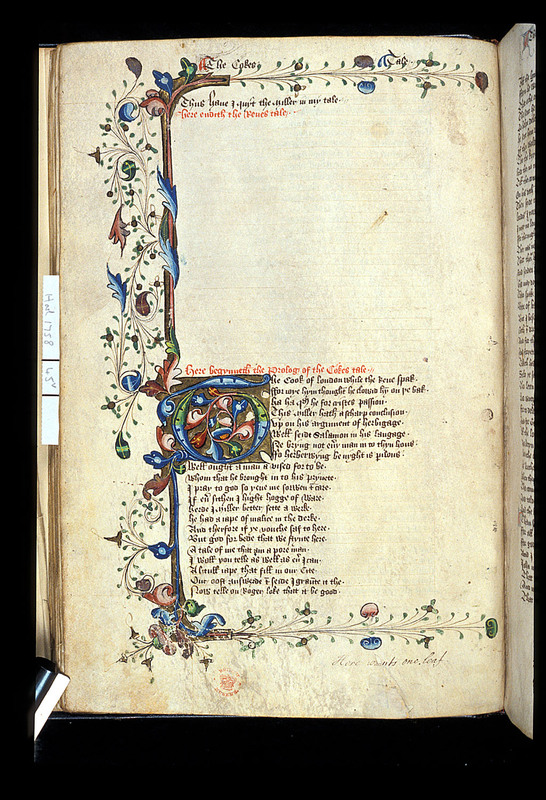 Opening Up Middle English Manuscripts: Literary and Visual Approaches. Cornell University Press, 2007. A website updates, a book doesn’t. This is one of the many ways to dichotomize two of today’s major competing media. However, such a categorical binary has not always been the case, and in the medieval world books were rarely ‘published’ in the way we’ve come to understand. Take for example the manuscript British Library Harley 1758. It was produced sometime between 1450 and 1500 and contains a copy of the Canterbury Tales, including the spurious Tale of Gamelyn. It seems to have been written by three distinct scribes and then corrected by a supervisor of sorts. While finely decorated and illuminated, there are notable gaps throughout the manuscript. Such gaps were clearly intentional at some stage in the process and similar blank spaces can be found in other manuscripts from the Middle Ages. The gaps in Harley 1758 (found on folios 45v, 102, 127 and 200) all fall between the end of one character’s tale and the beginning of another’s. The reason behind such premeditated gaps seems to be an intention to fill them with a portrait of the upcoming speaker. 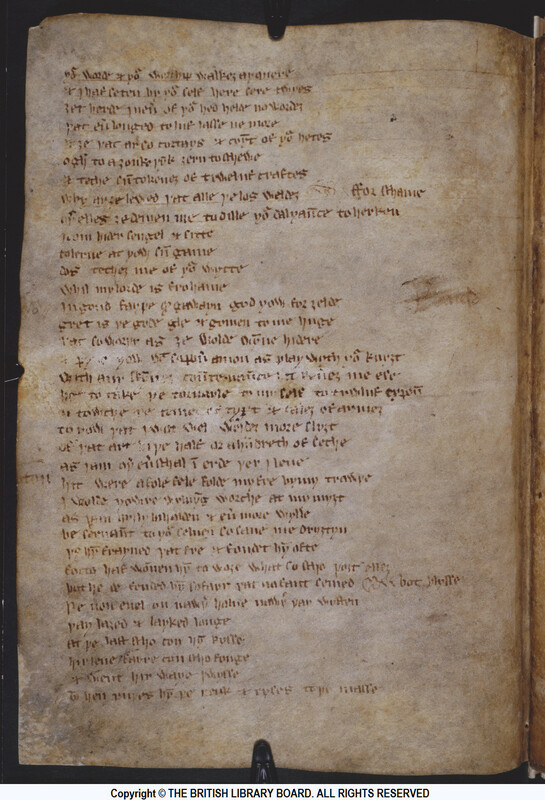 For example, on folio 102, the gap in the manuscript comes between the rubricated sentences Here endith the gode wifes tale of Bathe and Here begynneth the prolog of the ffrere. Presumably, then, the plan was to place a portrait of the Friar to fill in this gap. 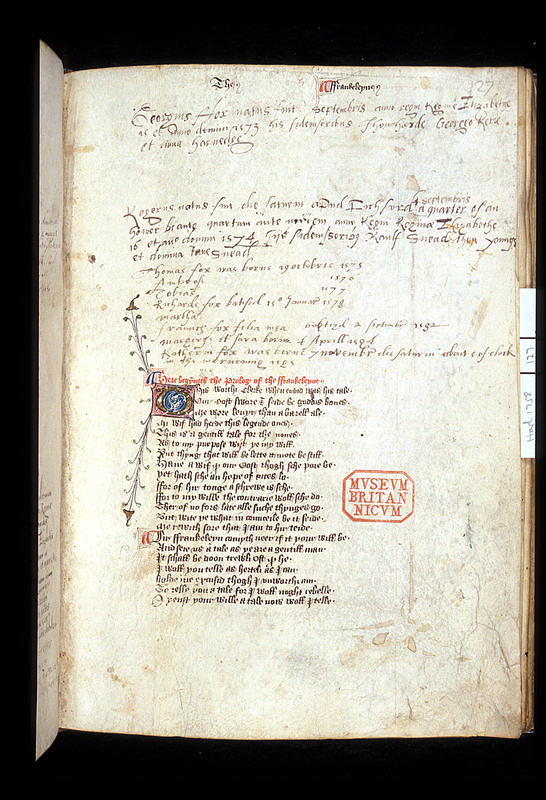 Similarly, on folio 200, we find a gap beginning at the top of the manuscript and ending with the sentence Here begy[n]neth the prolog of the ffrankeleyne. 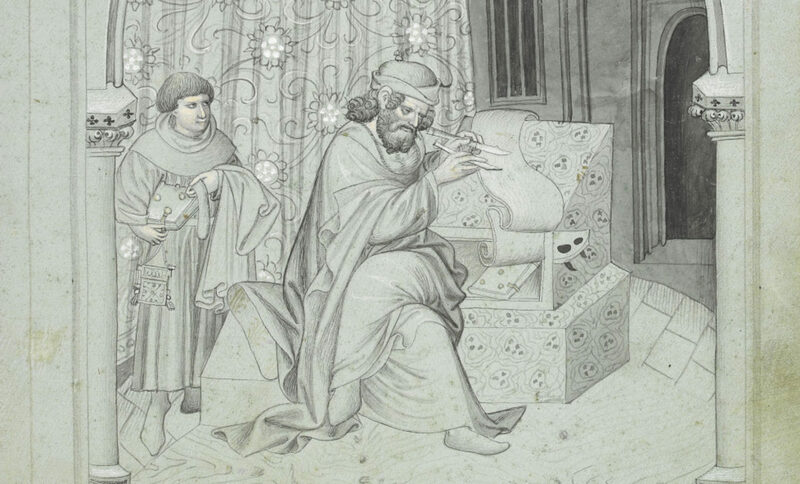 In this manuscript, portraits of the Cook, Friar, Manciple, and Franklin, were all clearly intended but have been left out in the process of manufacturing. The modern mind, strongly rooted in the print culture of the last few centuries, immediately wants to call this an ‘incomplete’ manuscript. By the simplistic standards set out above for a book, this work is clearly missing pieces intended for inclusion and therefore cannot be called ‘finished’ or ‘published’ in the sense we think of today. However, in a time with limited writing materials and a high cost of production for a single manuscript, books were an evolving entity and constantly updating in purpose and function. Moreover, as stated above, books like Harley 1758 were the product of numerous workers, all of whom had to be paid. In scenarios such as these, the eventual owners of the book funding its production might have simply run out of money. Even still, the book was ‘published’ despite its missing pieces, and its gaps cleverly used for other purposes in later times. Folio 127 of the work has been carefully reused to record the birth dates of the children of Edmund Foxe of Ludford, a 16th century clerk. This type of genealogical information is commonly found in medieval manuscripts, since, as stated above, the preciousness of such items made them valuables in medieval and early modern times. The gaps in Harley 1758 give us insight into medieval and early modern usage of books and thoughts on the concept of publication. It is clear that the print-age dichotomy of finished and unfinished breaks down for medieval books, and perhaps their status is more akin to modern notions of website updates.